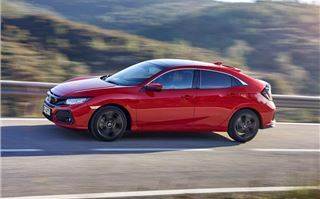 Honda says the objective of the new 2017 Civic is to regain the 'essence of Civic'. Which we're pretty sure isn't something you can get over the perfume counter in Boots. Instead it describes it as a 'distinctive sporty driving character'. This was something that was missing from the previous Civic. 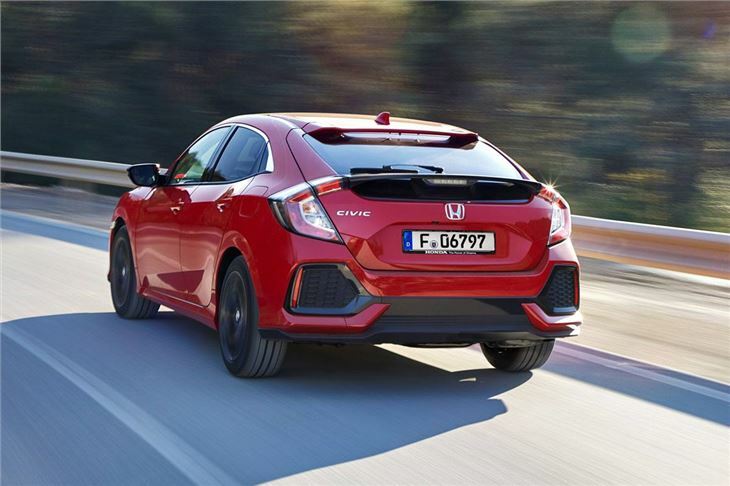 That car certainly upped the quality of Honda's popular hatchback, but it lost some sparkle along the way. So can this all-new model recapture that magic? We'll cut straight to the chase. Because this Civic is good. Really good. 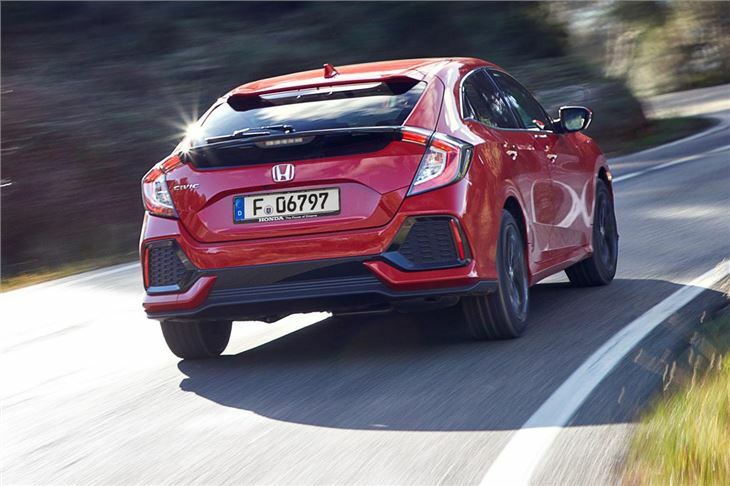 Honda has developed a car that's as quiet and refined as any of the competition, including premium German stuff, yet enjoyable to drive. The steering has a nice weight to it, plus it's precise and responsive. But the Civic also rides impressively well, helped by a new multi-link rear suspension system. That may mean nothing to you (and diagrams of it are even more dull...) but all you need to know is this more sophisticated suspension means the Civic not only rides smoothly but is much better in corners. The fact the Civic is a bit longer helps too. It may look like it's had a growth spurt, but this Civic is actually only 13cm longer than the old car. This means it's longer than a Ford Focus but not quite as big as a Skoda Octavia. There are big changes inside with a redesigned interior and new features like an electric parking brake. 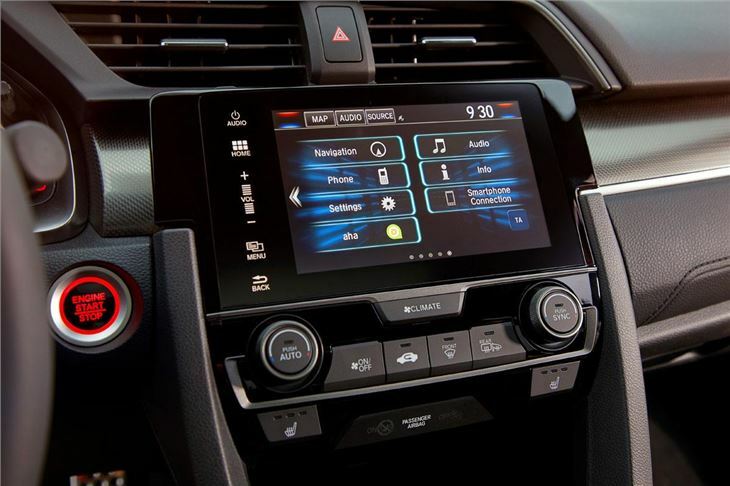 The three circular dials have been replaced by an all-new instrument display and there's an updated Honda Connect system. It's better but there are some small gripes. 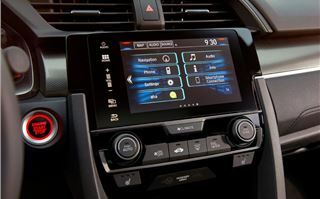 To turn the radio down requires you pressing a touch button repeatedly (what's wrong with a dial...) and changing the fan speed has to be done via a menu in the touchscreen. Honda has surprisingly ditched the clever Magic Seats of the old car - a unique feature compared to the competition - and gone for a conventional rear bench. Research by Honda showed that owners were rarely using them, but we still think it's a real shame and limits the Civic's versatility. There are no complaints about the overall quality and finish though - the Civic is up there with the best hatchbacks around. There is decent rear leg room, although not as much as a Nissan Pulsar. But the big difference is more space for those in the front, along with a lower driving position with plenty of adjustment in the driver's seat. The boot is also still huge, making the Civic the best family hatchback around when it comes to carrying capability. With close to 480 litres of space it outstrips the Volkswagen Golf by a full 100 litres. Although if you go for a Sport or Sport Plus, the sporty centre exhaust means you lose the under-floor boot section. 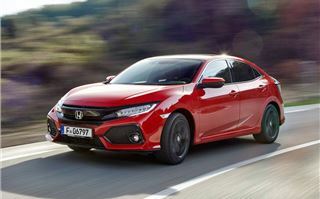 To begin with the new Civic is only available with petrol engines, both of which are brand new. Honda has finally ditched the non-turbo 1.4-litre and 1.8-litre, replacing them with shiny new turbocharged engines. The belt cam (belt in oil) 1.0 VTEC we're testing here is likely to be the more popular plus there's a four-cylinder chain cam 1.5 VTEC with 182PS. The existing chain cam 1.6 i-DTEC diesel will be carried over and added later in the year. 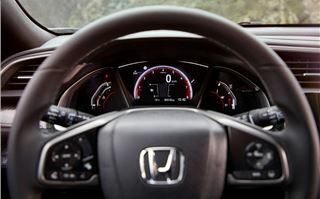 It may seem too small for a car the size of the Civic, especially now it's grown, but the 1.0 VTEC is quite a surprise. We're used to seeing three-cylinder engines like this in small hatchbacks like the Ford Fiesta, but in a family car like the Civic? Well put aside any pre-conceived ideas you may have as this is the best 1.0-litre engine around. Yes that's a big claim. But it really is that good. Honda has a strong track record for developing impressive engines and this 1.0 VTEC with 129PS is another. It has the get-up-and-go of a three-cylinder and while there's not masses of torque, it pulls surprisingly strongly in-gear. But it's the minimal noise, smooth nature and general refinement which makes it so good. Unless you really rev the socks off it, you can barely tell it's a three-cylinder engine, with none of the vibration through the pedals and into the cabin that's often a characteristic of smaller turbo engines. It should prove reasonably economical with a claimed figure of 55mpg and above - although it's dependant on what trim level you go for. The standard six-speed gearbox has a rewardingly positive shift to it but if you want an automatic there's a CVT available. 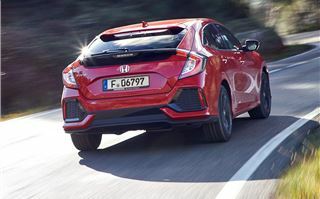 While the automatic works well with the more powerful 1.5 VTEC, it's not well suited to the 1.0-litre engine and hampers performance while generally making the whole thing feel lethargic, even when you're just pottering about town. Unless you really must have an auto, we'd avoid it. 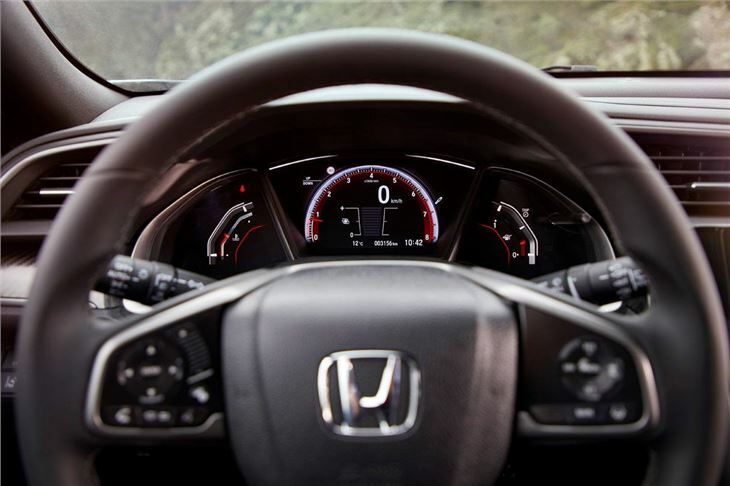 While this Civic has changed considerably, there are some familiar Civic trademark features. The odd split tailgate glass being one of them. One new oddity is the luggage cover (we'll stop short of calling it a parcel shelf) which slides across sideways, the idea being to save space. One thing the Civic doesn't get however is a spare wheel. It does however come with plenty of standard kit. The SR model we tested comes with Honda Connect 2, 17-inch alloys, front and rear parking sensors, a rear parking camera and dual-zone air conditioning. If you want leather seats though you'll have to go for a Prestige or an EX. 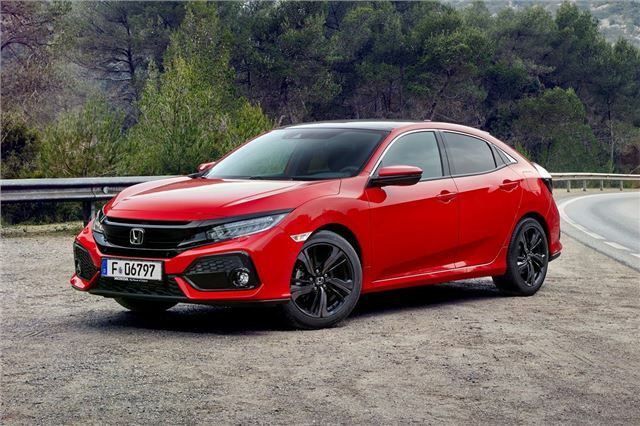 Refined on the move, high quality inside yet enjoyable to drive, the new Civic has managed to recapture the sparkle it lost. And the new 1.0 VTEC turbo engine is a real gem, suiting the Civic perfectly. The competition is tough, but the new Civic is up there with the best. 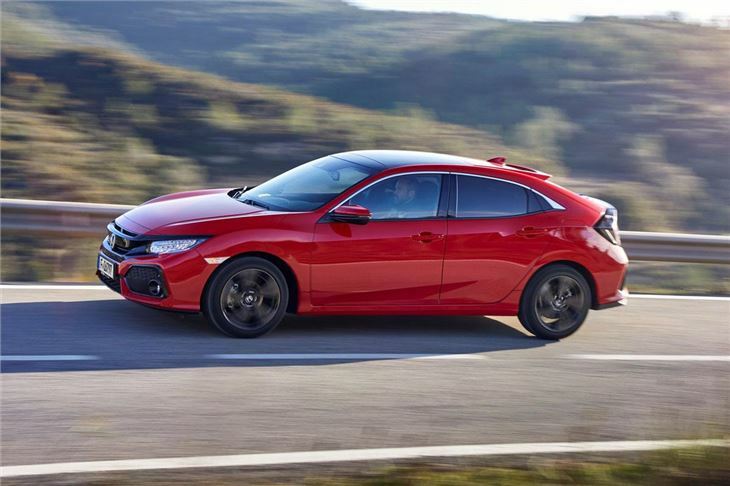 The Honda Civic goes on sale in March. There will be no three-door model nor an estate but the Type R is due in late summer 2017.